Handicap shower grab bars supports and aids in wheelchair transfers and the shifting of the body during showering. The addition of a shower grab bar is necessary. Handicap shower grab bars are very important for persons with disabilities. Getting in and out of, showers and bath tubs, using handicap grab bars, not only make a person feel more confident, but they can make the difference in being able to shower or not. A well placed bar will support a person as they move in and out of the shower. Additional bars should be installed inside the shower so they can be used while showering. They provide not only support but aid in transfers and shifting of the body while on a shower chair or if the person is using a wheelchair or shower commode. Often family members, who share showers or bathrooms with disabled persons, find themselves using and enjoying handicap grab bars. They should be informed never to place towels on grab bars. Towel bars should be installed in a way that they will not be mistaken for handicap grab bars. Nor should handicap shower grab bars be used as towel bars as that would interfere with it’s intended use. Imagine using a grab bar as a towel bar rack and when you grab on, the towel removes the grip of the bar, causing you to slide your hand across. This can only lead to dangerous accidents. Use the handicap grab bars as it was intended and you will be safe. Where should handicap grip bars in a handicap shower be mounted? It is especially important that grab bars are placed in the proper locations, and at the proper angle. Angling the grab bars 45 degrees and placing grab bars out of towel reach are such ways. Folding grab bars can be lifted up and put away after use and can help in not getting mistaken as towel bars. Consult the person who will be using the bars as their preferences can differ from other people. Make sure they fit the guidelines of ADA shower grab bars. Where Do You Put Grab Bars in a Shower? You have to consider your own needs above all else. For private homes, you should install the shower grab bar where it is most convenient for your use. Most people place the grab bars along the walls parallel to the tub or shower, about 3 feet off the ground floor. Another way to position the grab bars is slightly angled and perpendicular to the shower. This grab bar placement allows for a wider height range of support. When installing a grab bar for someone else, ask them what their preferences are in terms of location. Follow ADA guidelines if the location will be accessed by the public. To get more ideas and images on grab bar placement, check out the shower handrails section. More often than not, hotel rooms and public facilities are equipped with grab bars. Rooms for disabled persons can be requested while making reservations. The recognition of this need has made traveling much more convenient, for the disabled and handicapped, than in the past. Suction grab bars – The main benefit of these suction grab bars is the ease of removal and ability to be placed anywhere that cannot be nailed into. Chrome grab bars – These chrome grab bars are available in angled, straight or a combination of both. Chrome decoration is a nice addition to a modern bathroom. 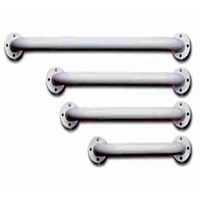 Heavy duty grab bars – Strong and durable grab bars that can support heavier weights. For these shower grab bars to be installed properly, they must be affixed to wall studs or other equally strong materials. Bathtub grab bars – These tub grab bars are mounted on the curb of the tub and helps the user to get in and out in a stable manner. Most can be installed easily with a clamp or be screwed tightly onto the curb. While usually not paid for by medical insurance, the cost of handicap shower grab bars is quite affordable. Many styles are available, and they are designed for ease of installation. A full bathroom can be equipped for around one hundred dollars if installation is done by the homeowner. When relatives and friends recognize the need they are usually always glad to help with cost and installation. Informational Resource For Handicap Showers.